So I went and interrupted their negotiations with my offer of $600 and the kid looked at his dad all desperate, like what are we going to do? His dad said, "Naw, you don't wanna pay that kinda money" and they walked away. I bet that kid still isn't talking to his dad to this day. Bad day for him, good day for me. You can tell because that was 27 years ago and I can still see the kid's face as they walked away. I felt bad for him and everything, but I had my car! I hadn't even taken it for a test-drive yet. So I did, then I bought it. I almost got my first ticket in it on the way home, too. Got a little sideways coming around a corner and the cop who was coming towards me just pulled out into the middle of the road like, "Pull it on over there, boy". I lied and told him I wasn't used to the high-performance clutch that was in my new car. Although I don't think he believed me, he let me go with just a warning. I never have gotten a ticket in that car. I don't drive it that way very often anymore though. My closest races (I've never lost one "yet") a '69 Roadrunner and a '70 GTO. Both so close I could have mouthed, "You lose" to the driver of each and they would have heard me. This story reminds me of my first car. I was 16 had $900 burning a hole in my pocket and my brother wanted to sell me his '76 camaro. To date that thing was the fastest, most dangerous, and most fun-to-drive vehicle I have ever driven. My mother's '96 Firebird comes close, but no cigar. 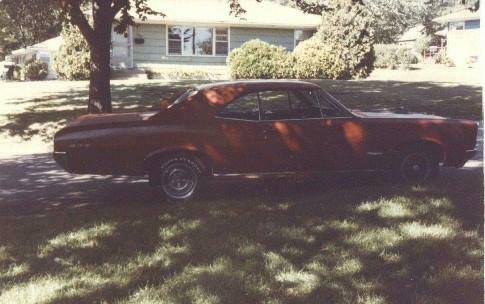 My brother used to have a '67 Chevelle SS, but sold it before I got the GTO so we never were able to race. We argued plenty about which was quicker, but when I finally let him drive it he admitted that it would probably have beat his Chevelle. That was gold, baby!